Behold the past, behold the future of BMW Group, the most successful carmaker in the entire auto industry, recently turning 100 years of existence on the market. Throughout the century, marked by wars, industrial and economical disasters, falls and rises in all aspects of life, BMW has managed to stand the test of time and delivered the best services in the auto industry, which have changed our lives for ever. 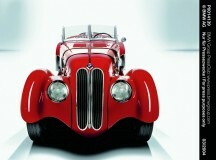 And as a celebration of its existence, we present to you 100 facts from 100 years of BMW`s exquisite history. 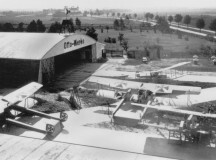 7 March – 1916 Bayerische Flugzeugwerke AG is established as the successor to aircraft manufacturer Gustav-Otto-Flugmaschinenfabrik with registered office at Lerchenauer Straße in Munich. In 1922, engine construction, the name and the brand logo of Bayerische Motoren Werke AG are transferred to this company. 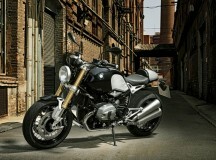 This is therefore regarded as the date of establishment of the “New BMW AG”. 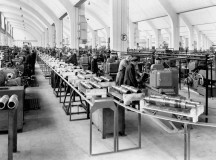 21 July 1917 – The aero-engine maker Rapp-Motorenwerke GmbH, founded in 1913, is entered in the Commercial Register with the name of Bayerische Motoren Werke GmbH, and soon afterwards, new manufacturing facilities are set up at Moosacher Straße in Munich. 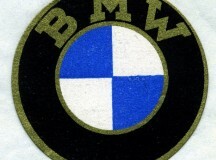 10 December 1917 – The round brand logo with the letters BMW and the stylised propeller designed in the Bavarian national colours of blue and white is entered under the number 221388 in the Trademark Registry of the Imperial Patents Office. 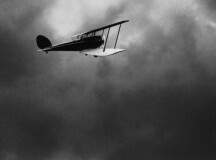 At the end of the 1920s, this livery appears for the first time in advertising as a stylised rotating propeller, which has since then formed the basis for the interpretation of the logo. 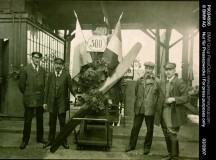 17 June 1919 – Test pilot Zeno Diemer reaches an altitude of 9 760 meters in his aircraft manufactured by Deutsche Flugzeugwerke and powered by the BMW IV inline six-cylinder engine, setting up a new world altitude record. 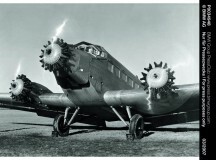 6 July 1922 – Bayerische Flugzeugwerke AG takes over the company name of Bayerische Motoren Werke, the brand logo and engine construction from the current owner, Knorr-Bremse AG. 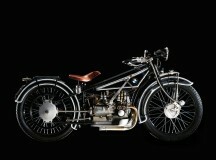 28 September 1923 – At the German Motor Show in Berlin, the BMW R 32 is presented: the first motorcycle produced under the brand, developed under the management of Max Friz, powered by a horizontally opposed twin-cylinder, four-stroke Boxer engine. 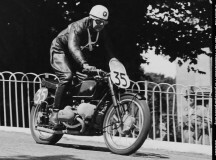 2 February 1924 – Engineer and racing driver Rudolf Schleicher achieves the best time riding a BMW R 32 in the hillclimb on the steep Mittenwalder Gsteig – and brings home the first victory to BMW in the history of motor sport. 1 October 1928 – BMW takes over automaker Fahrzeugfabrik Eisenach in Thuringia where the Dixi 3/15 PS small car is manufactured as a licensed version of the British Austin Seven. This makes the company a manufacturer of automobiles. 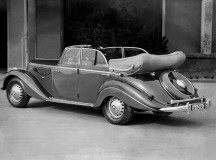 22 March 1929 – The first BMW 3/15 PS rolls off the assembly line in the production building rented from coachbuilder Ambi-Budd at the old Berlin-Johannisthal airfield. 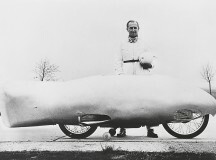 22 June 1931 – The “Rail Zeppelin” powered by the BMW VI twelve-cylinder aero-engine built by railway designer Franz Kruckenberg reaches a speed of 230 km/h and thereby achieves a new world speed record for rail vehicles. 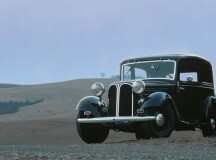 1 March 1932 – BMW ends the licence agreement with Austin and soon afterwards presents the company’s first in-house automobile design: the BMW 3/20 PS with a new four-cylinder engine and a two-door all-steel body. 22 July 1932 – Pilot Wolfgang von Gronau takes off in the Dornier “Wal” (whale) flying boat, powered by two 600 hp twelve-cylinder engines of the type BMW VIIa, to complete the first circumnavigation of the world covering a total distance of 44 800 kilometres. 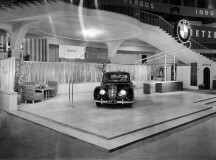 11 February 1933 – The BMW 303 is presented at the International Motor Show in Berlin as the brand’s first six-cylinder automobile and also the first model to be styled with the BMW signature kidney-shaped radiator grille. 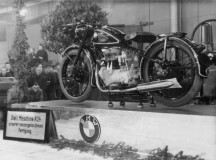 21 December 1934 – The construction of aero-engines is hived off to a dedicated company with retroactive effect to 1 January 1934 and becomes BMW Flugmotorenbau GmbH. 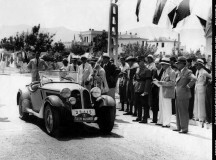 15 February 1936 – The BMW 326 is presented at the International Motor Show in Berlin as the new mid-range model powered by an inline six-cylinder in-line engine, designed with a box-section frame, aerodynamically contoured body and hydraulic brake system. 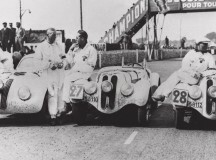 14 June 1936 – The two-litre BMW 328 sports car is presented in public for the first time racing in the Eifel Race at the Nürburgring – Ernst Jakob Henne immediately achieves a clear start-finish victory driving the new model. 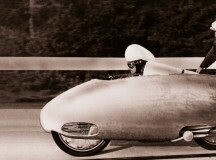 28 November 1937 – The BMW works driver Ernst Henne starts on the last of many world record rides and achieves a record speed of 279.503 km/ on a fully faired BMW motorcycle with a supercharger – a record that is only broken 14 years later. 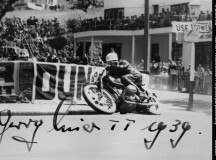 8 June 1939 – Georg “Schorsch” Meier is the first non-Briton to win the Senior-TT on the Isle of Man riding a BMW supercharged motorcycle. 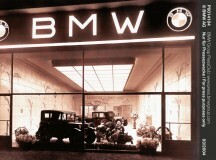 30 September 1939 – BMW AG takes over all the shares in Brandenburgische Motoren Werke GmbH in Berlin-Spandau. 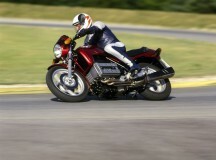 BMW had already been cooperating with the company on the development of air-cooled aircraft engines. 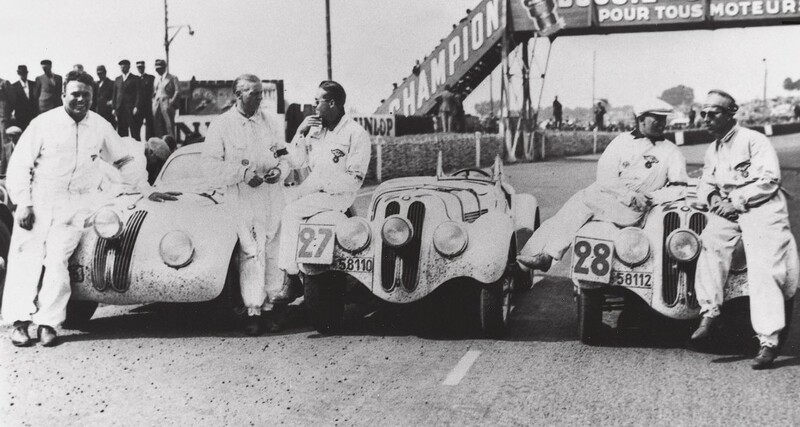 28 April 1940 – Fritz Huschke von Hanstein and Walter Bäumer achieve overall victory in the Mille Miglia endurance race in Italy driving the BMW 328 Touring Coupé, and they also win the team placing in all classes for BMW. 30 April 1945 – Soldiers from the 7th US Army reach the so-called shadow plant and the camp in Allach near Munich. 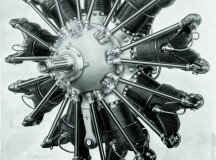 From December 1939, prisoners of war, convicts, forced labourers and inmates of concentration camps have been used there and at other locations to produce aero-engines. 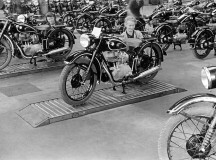 17 December 1948 – Motorcycle production is started up again in Munich. 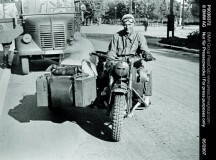 A BMW R 24 powered by a single-cylinder engine is manufactured there as the first vehicle from BMW AG in the post-war era. 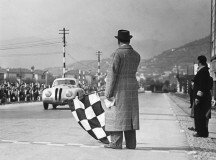 11 March 1954 – The BMW 502 presented at the Geneva Motor Show is powered by an eight-cylinder engine, the world’s first V8 all-alloy engine to be fitted in a volume-produced automobile. 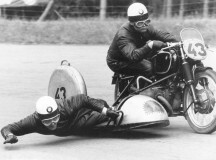 12 September 1954 – After their victory in the final race in Monza, Wilhelm Noll and Fritz Cron achieve their first World Championship Title in sidecar-combination racing on a BMW. 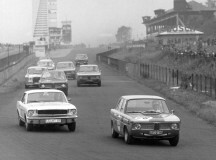 By 1974, BMW had succeeded in collecting 19 riders’ and 20 constructors’ World Championship Titles in this discipline. 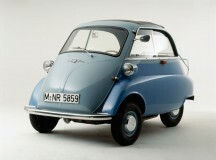 1 October 1954 – BMW acquires the licence to build a two-seater microcar with a front door from Italian manufacturer Iso. The BMW Isetta has a lot of refined details, it is powered by BMW motorcycle engines and marketed as a “Motocoupé”, the best-selling model sold by the brand during the 1950s. 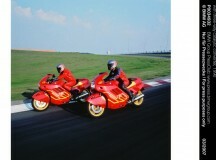 15 January 1955 – A new model series is presented at the Brussels Motor Show with the BMW R 50 and the BMW R 69 manufactured with a full swing arm suspension. 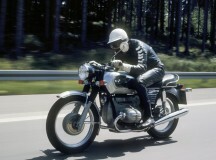 The series defined the BMW motorcycle programme until 1969. 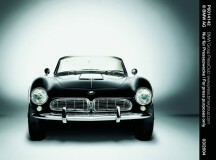 22 September 1955 – The BMW 507 made its first public appearance at the International Motor Show in Frankfurt. 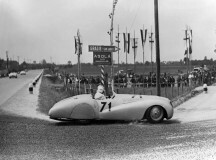 This roadster had been penned by designer Albrecht Graf Goertz with a 150 hp eight-cylinder engine and it is celebrated in the press as the “Dream from the Isar”. 9 June 1959 – The Board of Management of BMW AG presents the new BMW 700 Coupé to international journalists at a press launch. 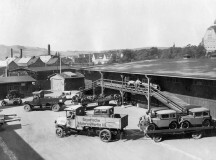 This car was to lay the foundations for profitable large-scale production of automobiles. 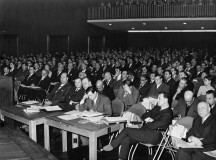 9 December 1959 – At the Annual General Meeting of BMW AG, a group of small shareholders prevents the takeover by Daimler-Benz AG. Major shareholder Herbert Quandt decides to make a bigger commitment which secures the independence of BMW. 30 November 1960 – The Annual General Meeting of BMW AG approves the restructuring plan for the realignment of the company and this charts the trajectory for a successful future. 21 September 1961 – The BMW 1500 celebrates its world premiere at the International Motor Show in Frankfurt – the start of the trailblazing success of the “New Class”. 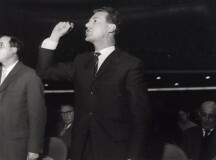 29 June 1964 – The positive business development encourages the Annual General Meeting of BMW AG to pass a resolution on paying a dividend to the shareholders for the first time since the end of the war. 18 June 1965 – BMW AG sells its remaining shares in BMW Triebwerkbau GmbH to MAN AG and brings its involvement in aero-engine production to an end for the time being. 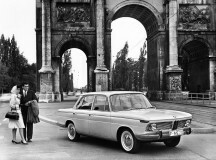 7 March 1966 – The two-door BMW 1600 is presented to guests in front of the Bavarian State Opera House on the occasion of the celebration of the 50th anniversary of the company. 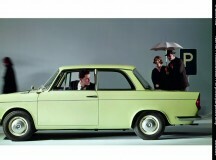 2 January 1967 – BMW AG takes over the company Hans Glas GmbH, which produces a number of vehicles including the Goggomobil microcar, numerous other models and agricultural machinery. 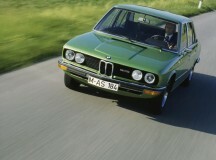 25 September 1968 – The new six-cylinder models BMW 2500 and BMW 2800 are presented at a press reception on Lake Tegernsee. After a break of several years, the brand once again enters the luxury class with these automobiles. 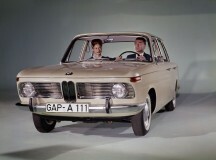 31 December 1968 – BMW AG concludes another record year. 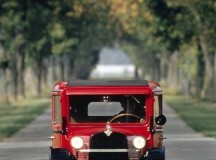 More than 100 000 automobiles are produced for the first time in one year. 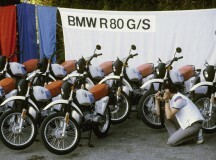 13 May 1969 – Motorcycle production at the BMW main plant in Munich comes to an end. 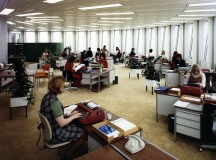 Production is relocated to the site in Berlin where the new BMW /5 Series starts rolling off the production line from September 1969. 16 March 1971 – The company enters the financial services business with the establishment of BMW Kredit GmbH. 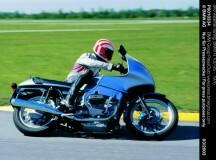 20 October 1971 – The new BMW test track and trial facility is opened in Aschheim near Munich. 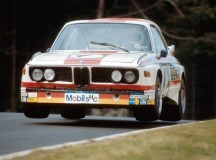 24 May 1972 – BMW Motorsport GmbH is established. It is responsible for all motor-sport activities and for the development of race cars and particularly sporty automobiles licensed for use on roads. 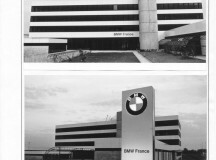 31 August 1972– BMW AG founds BMW (South Africa) (Pty) Ltd and has a majority shareholding in this sales and production company. This makes the plant at Rosslyn in South Africa the first production facility outside Germany. 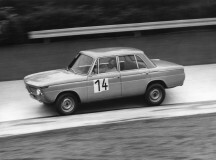 10 September 1972 – At the Olympic Games in Munich, a BMW 1602 Elektro is used as a support vehicle for the marathon race. 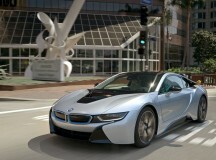 This is the first pure electrically powered automobile under the BMW brand. 12 September 1972 – BMW launches a new structure for model designations with the first BMW 5 Series as the successor to the “New Class”. This gives BMW clearly defined model designations that are easy to remember, and the principle underlying the system continues to this day. The first digit represents the series and the two subsequent digits specify the model based on the capacity of the engine. 8 January 1973 – When the BMW subsidiary is established in France, the company begins to take control of sales activities in the international markets. 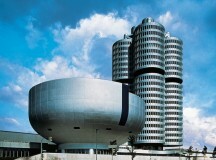 18 May 1973 – The new administrative building and the BMW Museum are officially opened. 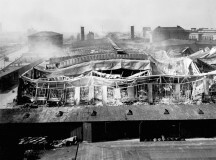 Construction of the structural shell of the “Four-Cylinder” and the “Museum Bowl” had been completed in time for the Olympic Games the year before. 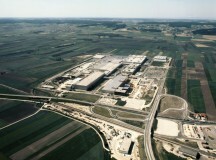 27 September 1973 – Production starts up in the extensively expanded and modernised Dingolfing Plant. 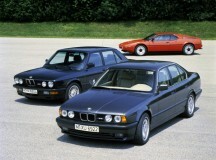 Initially, the models of the BMW 5 Series are manufactured there. 14 June 1975 – A BMW 3.0 CSL designed by American artist Alexander Calder is the first BMW Art Car to start at the 24 Hours of Le Mans. 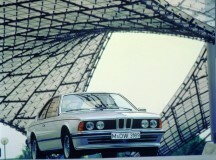 30 June 1975 – In Munich’s Olympic Stadium, the Board of Management of BMW AG presents the BMW 3 Series which is launched as the successor to the successful BMW 02 Series with new technology and new model designation. 3 February 1976 – BMW Motorsport GmbH is commissioned to establish a “driving school” which has become established as BMW Driving Experience and MINI Driving Experience, offering a training and experience programme for more joy and safety at the steering wheel. 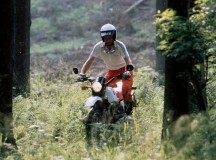 The first official courses start on 22 April 1977. 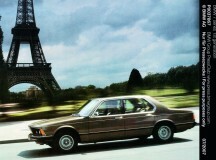 11 March 1976 – The coupés of the new BMW 6 Series are presented at the International Motor Show in Geneva. 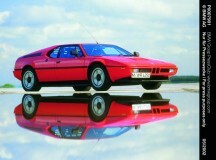 5 October 1978 – The BMW M1 is presented at the Mondial de l’Automobile in Paris. 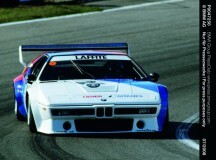 This is a mid-engined sports car generating 277 hp developed by BMW Motorsport GmbH. Its racing version creates a sensation at races including the Procar Series in the supporting programme for Formula 1 in Europe in 1979 and 1980. 21 June 1979 – Ground-breaking ceremony for the engine plant in Steyr, Austria, which today serves as a centre of competence for the development and production of a variety of engines including BMW diesel power units. 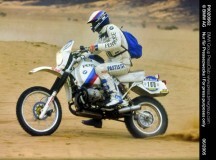 20 January 1981 – French racing driver Hubert Auriol wins the Paris-Dakar Rally riding a BMW R 80 G/S and provides further proof for the reliability of the Enduro model launched the year before, which is powered by a Boxer flat-twin engine. 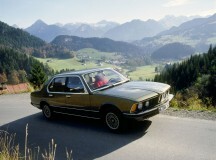 13 June 1983 – BMW presents the first series of automobiles in the company’s history powered by a diesel engine, the BMW 524td with an inline six-cylinder turbo diesel engine generating 85 kW/115 hp. 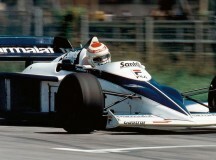 15 October 1983 – At the South African Grand Prix, Brazilian racing driver Nelson Piquet becomes Formula 1 World Champion driving the Brabham BMW – just 630 days after the premiere of BMW in the blue-riband event, and he is also the first champion in a vehicle with a turbo engine. 1 January 1985 – BMW Technik GmbH is established as an autonomous think tank and innovation incubator, which develops visionary vehicle and part concepts. 12 September 1985 – BMW presents the first all-wheel drive model at the International Motor Show, the BMW 325i all-wheel drive, and the extremely sporty BMW M3. 5 March 1987 – The BMW 750i is presented at the Geneva Motor Show, the first twelve-cylinder model to roll off a German production line since the end of the war. 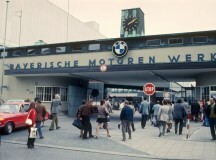 22 May 1987 – The new BMW Plant Regensburg is officially opened. 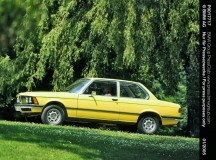 The first model that was manufactured there from the end of 1986 is the BMW 3 Series saloon. 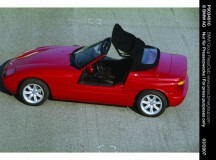 11 September 1987 – The BMW Z1 roadster developed by BMW Technik GmbH is presented at the International Motor Show in Frankfurt. 15 November 1987 – Italian racing driver Roberto Ravaglia becomes the first Touring Car World Champion driving a BMW M3 with the Schnitzer Motorsport team. 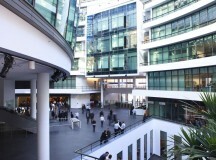 27 April 1990 – The Research and Engineering Centre (FIZ – today known as the Research and Innovation Centre) is officially opened with a gala ceremony in the Milbertshofen district of Munich. Around 7 000 researchers, engineers, designers, managers and technicians work there in a close-knit network. 1 July 1990 – BMW AG joins forces with its partner Rolls-Royce Plc to establish the independent company Rolls-Royce GmbH for the development, construction and sale of aircraft turbines, and this joint venture takes the company back to its origins. 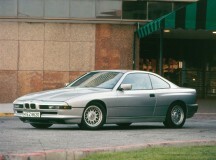 In the wake of the realignment of the company, BMW AG sells its shares in Rolls-Royce plc at the end of 1999. 10 March 1992 – The new plant of BMW Fahrzeugtechnik GmbH is opened at the traditional heritage site in Eisenach. Pressing tools are manufactured there for the company’s production network. 1 August 1993 – BMW Motorsport GmbH established in 1972 changes its name to BMW M GmbH Gesellschaft für individuelle Automobile (BMW M GmbH: For individualists.). 29 January 1994 – With the signing of the purchase contract, BMW AG takes over the British Rover Group, which includes the brands Rover, MG, MINI and Land Rover. 8 April 1994 – BMW Group Mobile Tradition is set up, and from 2008 it is responsible for all requirements relating to the company and product history as BMW Group Classic. 8 September 1994 – Vehicle production at the BMW Plant Spartanburg in the US state of South Carolina starts up – a BMW 318i is the first model to roll off the production line. The official opening of the new location is held on 15 November. 8 June 1998 – The company announces the continuation of the MINI brand, acquired through the purchase of the Rover Group, in an independent design. 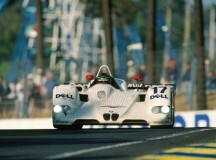 14 June 1998 – The BMW 320d is the first vehicle powered by a diesel engine to win the 24 Hour Race at the Nürburgring. 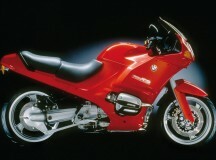 10 January 1999 – BMW presents the vehicle concept of the Sports Activity Vehicle at the Detroit Auto Show. The BMW X5 combines sportiness typical of the brand with the versatile qualities of an all-wheel vehicle and thereby establishes a new market segment with this concept. 1 October 1999 – BMW AG and the Rover Group are merged in the BMW Group, with the new structure highlighting the Group function of the company as an umbrella for several brands. 29 October 1999 – The BMW Tower known as the “Four-Cylinder” and the neighbouring BMW Museum are designated as heritage sites and become subject to protection. 9 May 2000 – BMW AG sells the Rover Group without the brands MINI and Land Rover to the Phoenix Venture Group, and two weeks later the Ford Motor Corporation takes over Land Rover. Only MINI remains part of the BMW Group. 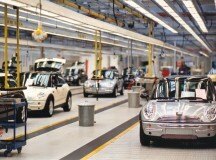 26 April 2001 – A few months after the relaunch of the brand, the first MINI rolls off the assembly line at the comprehensively modernised production plant in Oxford, United Kingdom, the original home of the classic Mini. 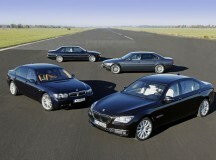 13 September 2001 – World premiere of the new BMW 7 Series at the International Motor Show in Frankfurt. 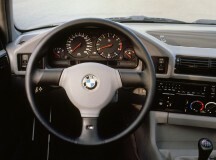 BMW introduces its revolutionary iDrive control system for the first time in the fourth generation of the luxury saloon. 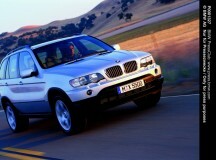 31 December 2002 – The BMW Group closes the business year with a new sales record. 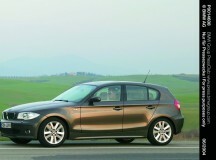 For the first time, more than one million cars of the BMW and MINI brands are sold within one year. 3 January 2003 – Since the beginning of the year, the Rolls-Royce brand has been officially part of the BMW Group. 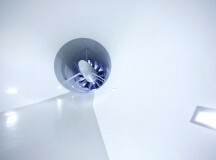 Rolls-Royce Motor Cars Limited goes on to present the first model of the new era at the company’s new registered office in Goodwood: the Rolls-Royce Phantom. 20 May 2004 – The Dadong production plant is opened in Shenyang in the north-east of China. 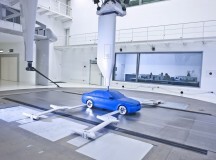 The plant is operated together with the joint-venture partner Brilliance China Automotive Holdings Ltd.
25 September 2004 – The sheer driving pleasure typical of the brand is experienced for the first time in the compact segment through the BMW 1 Series presented at the Mondial de l’Automobile in Paris. 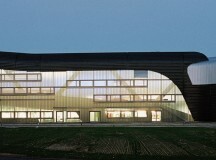 13 May 2005 – The BMW Plant Leipzig designed by star architect Zaha Hadid is opened. 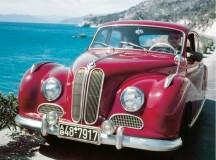 The first cars produced there are vehicles in the BMW 3 Series, and other models follow. 7 September 2005 – The BMW Group is listed for the first time in the Dow Jones Sustainability Index as the world’s most sustainable automobile manufacturer. 13 September 2006 – When production is launched for the new model generation of MINI, the British MINI Production Triangle officially starts operating with sites in Swindon, Hams Hall and Oxford. 27 September 2007 – The Board of Management of BMW AG presents the new Number ONE corporate strategy with the objective of long-term, profitable growth. 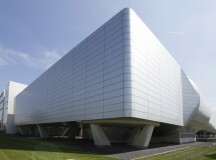 17 October 2007 – BMW Welt is opened. 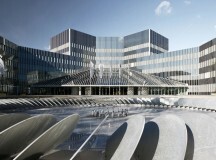 The futuristically designed building with multifunctional use offers a unique brand experience. Customers from all over the world can take delivery of their new car in an atmosphere that is typical of the brand. 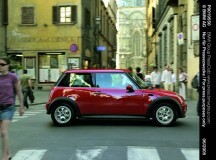 19 November 2008 – The MINI E is presented at the Los Angeles Auto Show. This is a pure electrically powered small car for field tests in routine everyday traffic. 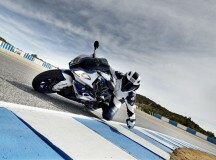 It is a product of the i project created by the BMW Group for the development of sustainable mobility solutions. 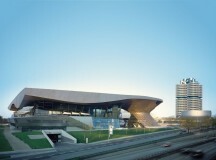 21 February 2011 – The new BMW i subbrand is presented in BMW Welt. The innovations developed by the company for the subbrand include electrically powered automobiles and innovative mobility services. 1 April 2011 – The DriveNow premium car-sharing service starts operating as a joint venture between the BMW Group and Sixt AG in Munich. 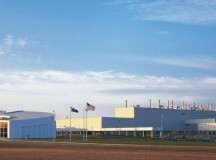 1 September 2011 – The carbon-fibre plant located at Moses Lake in the US state of Washington comes on stream as a joint venture between the BMW Group and the SGL Group. The plant supplies the starting material for production of the passenger cells in the models BMW i3 and BMW i8, which are made of carbon-fibre reinforced plastic (CFRP). 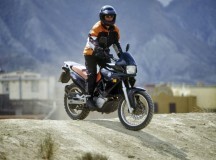 15 January 2012 – The German X-raid private team drives the MINI ALL4 Racing to victory in the Dakar Rally. 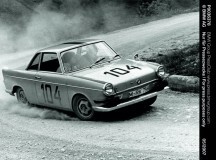 The car was designed on the basis of the MINI Countryman and was specially developed for endurance rallies. 29 April 2012 – After 18 years, BMW returns to the German Touring Car Masters (DTM) in Hockenheim on 21 October in a victory with three titles. 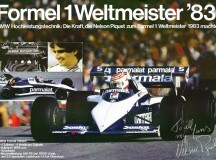 Canadian Bruno Spengler becomes DTM Champion in the BMW M3 DTM, and BMW also wins the constructors’ and team placings. 24 May 2012 – The Tiexi Plant is opened in Shenyang as the second production facility in China operated by the BMW Group and Brilliance China Automotive Holdings Ltd.
18 September 2013 – Production of the BMW i3 starts up at the BMW Plant Leipzig. 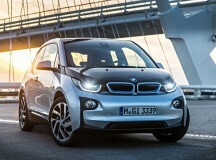 This empowers the BMW Group to put the first premium electric vehicle on the road. 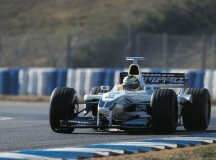 The car was designed right from scratch for this type of power unit. 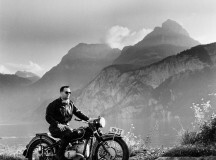 26 February 2014 – BMW Group Classic announces its move to a new site. This represents a return to the historic roots of the company. 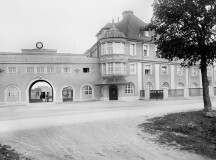 The purchase of the parcel of land in Moosacher Straße, Munich, from Knorr-Bremse AG brings some of the first production facilities back into the ownership of the company. 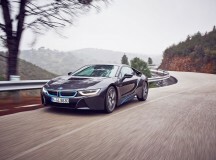 5 June 2014 – The first units of the BMW i8 plug-in sports car hybrid are handed over to customers at BMW Welt in Munich. 10 June 2015 – The new BMW 7 Series is presented in BMW Welt. The sixth generation of the luxury saloon offers unique innovations, including the body structure with carbon core, BMW gesture control and remotely controlled parking. 6 December 2015 – BMW i is granted the “Momentum of Change” Award by the United Nations at the UN Climate Conference in Paris for commitment to expanding the public charging infrastructure. This is the apogee of a unique series of national and international titles in the automobile sector, including the “Grünes Lenkrad” (Green Steering Wheel) for the BMW i3 and the “World Green Car Award” earned consecutively by the BMW i3 and the BMW i8. 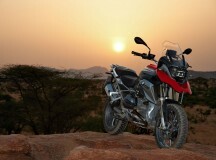 These awards were already given to the BMW i brand and its vehicles during the market launch phase. 6 January 2016 – The company uses the study BMW i Vision Future Interaction as the basis to present pioneering innovations in the areas of control and autonomous driving at the Consumer Electronics Show (CES) in Las Vegas. 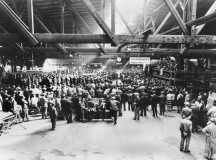 7 March 2016 – The 100th anniversary of the company is celebrated at a gala event in Munich’s Olympiahalle multipurpose arena. 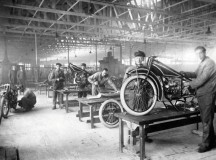 The post 100 BMW Facts from 100 Years of BMW`s Auto History appeared first on BMWCoop | BMW Blog, BMW News, BMW Reviews.